For other people with the same name, see Eleanor of Portugal. Eleanor of Portugal (18 September 1434 – 3 September 1467) was Empress of the Holy Roman Empire. A Portuguese infanta (princess), daughter of King Edward of Portugal and his wife Eleanor of Aragon, she was the consort of Holy Roman Emperor Frederick III and the mother of Holy Roman Emperor Maximilian I.
Eleanor was born in Torres Vedras on 18 September 1434, one of the nine children of King Edward of Portugal and Eleanor of Aragon. She was the third eldest daughter, but her two older sisters died when they were young, leaving Eleanor as the eldest surviving daughter. When her father died five days before her fourth birthday, Eleanor's brother Afonso V succeeded him as king with her mother as regent. The following March, her mother gave birth to another daughter, Joan, who would become the notorious wife of Henry IV of Castile. 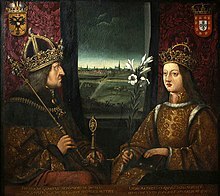 In 1440, Eleanor's mother was forced to go into exile in Castile after losing litigation against her brother-in-law Peter, Duke of Coimbra, for the regency of the young King Afonso. She left Eleanor behind, because she was ill at the time. Eleanor's marriage partner was likely suggested by her aunt Isabella of Portugal, Duchess of Burgundy. Arrangements were made by Eleanor's maternal uncle Alfonso V, King of Aragon and Naples, who, in 1448, sent artists from his court to paint Eleanor. Eleanor was also suggested as a marriage partner for Louis, Dauphin of France, the eldest son of King Charles VII, but she herself preferred to marry Frederick, because a match with him would give her the title of empress instead of queen. The practical negotiations were made in Naples and completed in 1451. During the sea travel, the fleet escorting Eleanor to Italy was tormented by pirates and storms, and there were rumours that she had been lost at sea. Eleanor and Frederick met in Sienna: Frederick was said to have paled when he saw her, partly out of excitement for her beauty, but also out of worry that she would have troubles giving birth because of her slender and frail appearance. The marriage took place in Rome. Upon her coronation, she was also given the name Helena, but she never used this name. The festivities was hosted by her uncle, the king of Naples. Eleanor and Frederick were dissimilar and never happy. She was an ambitious and willful woman who frequently participated in intrigues, whereas the emperor was a sober and uninspiring man. Her interest in dancing, gambling and hunting was not shared by Frederick, and their relationship was affected by their differences. Frederick sent Eleanor's vast Portuguese entourage home after the wedding because of the cost, and she suffered from homesickness; he also blamed her for causing the death of several of their children by letting them eat Portuguese food, and therefore took over the upbringing of the remaining children entirely for himself. During a period of siege in Vienna, when people were forced to eat rats, cats and dogs, she was known for trying to cheer people up. In historical writings, there is a sense that Eleanor was taken from a splendid, extravagant and luxurious court in Portugal to a cultural wasteland in Vienna because of her spouse's strict economic sense. On 16 March 1452 in Rome, she married the German King Frederick III, and the two were crowned Holy Roman Emperor and Empress three days later, on 19 March 1452, by Pope Nicholas V at St. Peter's Basilica. Her dowry was used by her husband to alleviate his financial problems and cement his power. Frederick III was the last Holy Roman Emperor to be crowned in Rome. Eleanor died in Wiener Neustadt on 3 September 1467 and is buried in the Neukloster, the Cistercian monastery of that same city, where her tombstone may be seen. This page was last edited on 22 January 2019, at 20:18 (UTC).